1/19/2013 – Garry Kasparov has been by far the most productive world champion in history, and it does not hurt that he is also regarded by many as the greatest. After covering the careers of other world champions, he turns his analytic eye on himself, publishing the first volume of an autobiographical trilogy in print and now as a ChessBase DVD. Here is a comparative review of the book and DVD. The announcement of the new ChessBase DVD, How I Became World Champion Vol. 1: 1973-1985 by Garry Kasparov had to have caused a great number of hands to be rubbed in glee. I know mine certainly were. 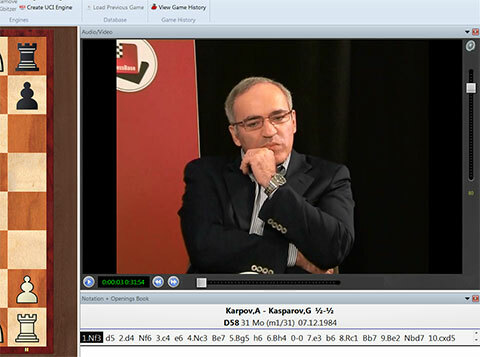 Although it is not Kasparov’s first DVD in the ChessBase family, it is the first on commented games, as the first four dealt with opening treatises. Garry Kasparov has been by far the most productive World Champion in history, and it does not hurt that he is also regarded by many as the greatest. 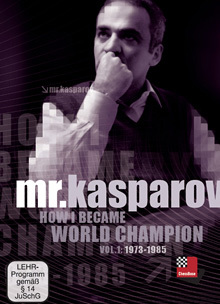 He began publishing before his world championship title, theoretical works together with his trainer and friend Alexander Nikitin, and no sooner had he wrested the title from arch-rival Anatoly Karpov in 1985, he published a book on the match, also illustrating very clearly his approach to analysis (i.e. exhaustive). The body of his works slowed down considerably after that though, and while a book on the 1986 match also came out, and Test of Time, his urge to put everything down on paper seemed to have cooled down somewhat. Then in 2005, he announced his surprising retirement to forward his political ambitions, and held to it. 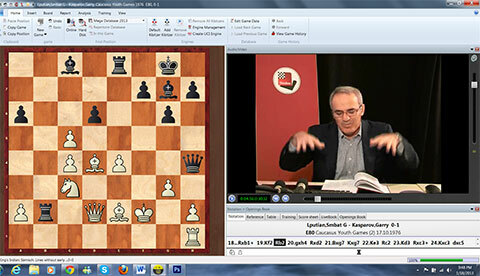 However, this was not the end of Kasparov in chess, it was the beginning of a new era: Kasparov the author. What followed soon thereafter was a colossal series of works, many of which are modern masterpieces, and certainly one of the greatest chess legacies of all time. The most notable was unquestionably “My Great Predecessors”, offering a unique historical overview of the world champions preceding him, in five massive volumes. Still, despite the many works, there was one glaring omission in his coverage: Kasparov himself. It is true, he published a mammoth series solely on his encounters with Karpov, and even if a fascinating overview of the greatest rivalry in the game’s history, they were of a very specific aspect of his career. That is, until last year, when the English translation of the first book in a new trilogy came out, purporting to be the definitive work on his entire career. Now, we also have a DVD version of the book, but the question will obviously be: how do they compare? The ChessBase DVD is very typical fare for ChessBase, with the usual superb production values that we have all come to expect. It contains sixteen videos with over six hours of viewing, and spans his first encounter with the game to the first aborted world championship title match in 1984. After this introduction to the nature of the work, what the books will include, we are taken immediately to the first game, played at age eleven, against Privorotsky, an experienced master and solid positional player. More importantly perhaps is that Privorotksy was his coach at the time, so the pressure for him to win was all the greater. To say it was a masterful route by young Garry would be an utter fiction, and Kasparov willingly points out not only the opportunities missed by his former coach, but even the reasons he believes led to them. Naturally it does highlight the attacking talent of Garry at this age, with an ending to arouse a smile on any player. This in fact is already the first major divergence from the actual book. I live in Brazil, where obtaining chess books usually involves a very lengthy wait after ordering online. I was ready to go through this onerous process (my last order took seven weeks to arrive due to customs bureaucracy, despite not being charged any tariffs), but was surprised to discover that Amazon offered a Kindle version. While I do not own a Kindle, I do read digitalized books on my 7-inch tablet (a joy for anyone who loves to read), and it has the Kindle software. I downloaded a sampler and was amazed at how good it looked. The text was perfectly formatted, and the diagrams were of a suitable size. Two extra perks were that it cost 70% less than the print book itself, and I could read it within one minute of paying. In fact, after seeing this, I immediately took advantage and bought Najdorf’s masterpiece on Zurich 1953 as well. If you plan to buy Kasparov’s book, and I recommend it, know that it is not simply an expanded version of the DVD with more games and more variations. It is an exhaustive autobiography detailing his earliest memories, before chess, as well as every event he played in and all the players. I was actually completely shocked when I read this. My own introduction to reading is extremely similar. In New York, my father would buy the New York Times every morning and read it at breakfast. I was also anxious to partake in the same things, and would take a part of the newspaper, unfold it on the floor, and ‘read’ it. I was not quite three when they found out there was more to it. One morning my mother asked me what I was doing, and I replied I was reading the newspaper. She asked what I was reading, expecting some cute answer, and I started to read out loud the headline on the page I was sitting on. Needless to say, despite this unusual story, this is where our similarity ends, since I obviously did not inherit the same prodigious memory, and of course our lives veered off into radically different directions. Throughout the book, you will also find innumerous testimonial contributions by those who knew him, most especially Nikitin, Kasparov’s longtime coach, who peppers the text and game notes throughout with his impressions of the young Kasparov as he grew from shining talent to world champion. In many ways this would seem to reinforce the impression that the DVD is just a highly abridged version of the book, but in fact this is not so. They are actually very different experiences which happen to share much of the same core period and material. For one thing, there is nothing quite like having Garry Kasparov himself present his life, his games, with his voice and facial expressions. He himself seems unaware of the invaluable power of this as he almost apologizes at first for not being able to give everything in the book. The sad truth is many might not really want it. Most players and fans are unlikely to go through the entire book even if they buy it, though they will regret not being able to see more games simply because there are so many and each one has so many exhaustive variations covering every aspect imaginable. They are a tribute to Kasparov’s endless quest for the truth, but for those particular players and fans, this might provide that happy compromise. 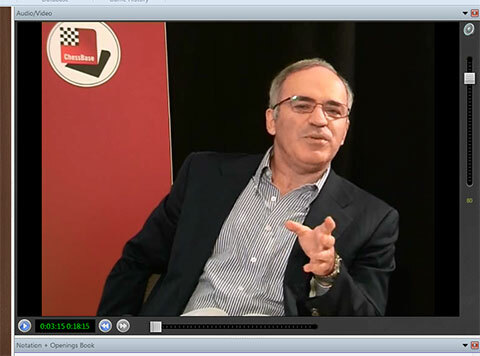 The ChessBase DVD provides a far more laid back experience, allowing the fan to click on a video, and just watch Kasparov present the games and stories in all their glory. It comes with sixteen videos, starting from the ripe age of eleven in to the famously aborted 1984 match, but sixteen videos do not mean only sixteen games. Far from it. The first video, the Weinstein years, shows his early efforts, not only against Privorotsky, but also against Yermolinsky, and Kantsler. The games represent important points in his career for a variety of reasons, and even here he shows his sincerity to adhere to his selection process as the loss against Yermolinksy was the source of fun poked at him for a year. The games certainly show the promise of the player he became, but you will need to wait for the next video, “Junior tournaments” to first see his incredible attacking talents and peerless feel for complications. “Junior Tournaments” starts with a game against Smbat Lputian played in 1976 at the Caucasus Youth Games, and it is our first demonstration of the champion-to-be. The game is his trademark King’s Indian, and he describes with understandable pleasure the moment in which a key blow is delivered to an unsuspecting opponent. We are regaled by three more games, including the magnificent finale against Elmar Magerramov, before proceeding to the third video, his first foray into a fully adult field, the 1978 Sokolsky Memorial. Kasparov is modest in his assessment, and tells his mother that a +2 score would be a good result, yielding him a Master norm. As it were, he ended up scoring a massive +9, and the untitled unrated player began to gain significant international attention as a result. Little by little (or not so little), he rises to the top of the ladder, from second reserve at the Olympiad, to board two at Lucerne 1982, sharing his victories and thoughts, and many magnificent games. It is fascinating to see what he is like as an analyst, not for the games of others, but his own. True, this is hardly his first work analyzing his own games, but here he takes a deeper look at himself, striving to understand more than the moves and ideas in the games, or even their sporting significance, but also the psychological reasons, as much for his opponents as for himself. Examples abound, and the reasons as well. 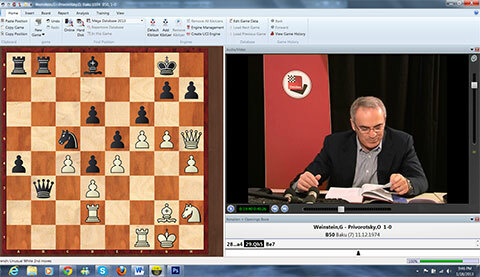 The first example actually comes from his very first game in video one against his teacher Privorotsky. When under direct fire on his kingside, Privorotsky plays Bd8-e7 and fails to see the vital resource Bd8-a5, Kasparov does not superficially dismiss it as stress of the moment. Instead he points out the rather the contradictory nature of the move, playing away from the kingside to save the king, as opposed to bringing in the pieces to protect it. When he makes a last-minute change in his opening prior to his 4th game loss to Beliavsky in the 1983 Candidates match, he is unforgiving and classifies it as a moment of unjustified panic that was meritoriously punished. He introduces his first Candidates match against Beliavsky in 1983 with some comments for younger players who missed that era of the game. He explains that at that time, the matches were considerably longer. His quarter finals match was set as the best of ten games, with a possible fourteen in the event of a tie, at a rate of three games a week and an option for a timeout, not to mention the adjourned games. Truly a different time. We are also given a glimpse into his admiration and tribute to other historic figures as he explains that prior to game five of the very same match, he had known that it was Fischer’s 40th birthday, and though a recluse whose whereabouts were unknown at the time, he had wanted to win the game in honor of this birthday. Although everyone knows the crushing stranglehold he had on the chess world for two decades, it is not all about winning by +9 scores, and it is here too that the video shines in ways no book can. 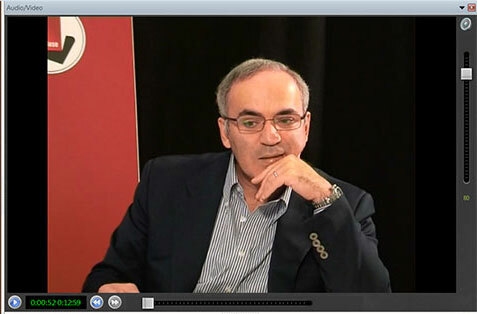 In his video on the semi-final match against Korchnoi, Garry Kasparov opens with the comment that the first game was lost. There are no excuses or explanations given to suggest he played worse. His voice changes dramatically and he stops looking at the camera, visibly haunted by the memory of this ‘devastating loss’ as he himself describes it. Although a text could write about the impact of it with great eloquence, words cannot truly do justice to this moment caught on camera. Again, this is by no means to suggest it is preferable over the epic book, but simply to highlight the different flavor it brings. Apples and oranges. Finally the great match in 1984 is reached, a topic on which so much has been written and said over the years, that he chooses not to beat that very dead horse again. As time has passed, his reasons for being down four games after the first nine have come down to his own weak play, for which he has no explanation, and readily admits that by all means he should have lost the match. After all, after game 27 he was down 0-5 and all Karpov needed was a sixth win to secure victory. Such were the match conditions. Instead, the reigning champion failed to win another game for the next 21 encounters, at which point fatigue had begun to take its toll and the score to do an about face. It is after analyzing the 48th and final game of the giant match, his third win, followed by its interruption, that Kasparov closes the book, a work he is visibly extremely proud of and the most attached to, and ends the video. I thoroughly enjoyed both the book and the DVD and highly recommend them. It was almost impossible to imagine not recommending a work of his, considering the superlative standard he has always set himself, and this one does not disappoint.